You know, or may have heard (and if not, now you know! ), Feminine Energy has been rising up. We had the #metoo movement happen just recently. Liken that to Feminine Energy realizing/accepting/acknowledging she’s been wronged - and finding the courage to speak about it, to the masses. That was a Healing M*fo....and it was just what we All needed. I felt it bubbling up the month before, with my own experiences coming to the surface . 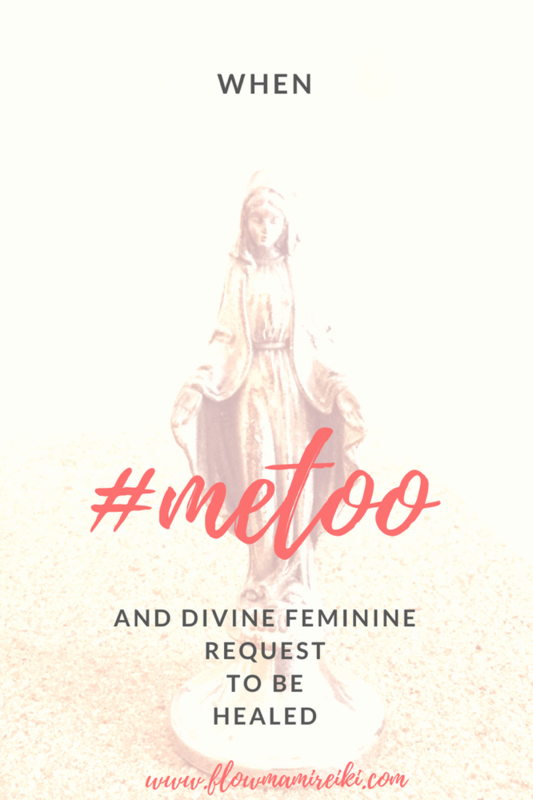 As the #metoo movement finally erupted Internationally, I realized that together, it was Time for us All to begin Healing the same topic. For some time, I was reacting all sorts of Cobra-like, while the Energy slowly made its way to the surface. On one particular night, as I broke down in tears, from a deep and ancient *ss place, my hands started to activate with Energy. And following what I felt at the moment, I started sending this healing Energy to ancestors. (An example of something that can be done when you’ve learned Reiki II). Generation, after Generation, and on and on, further and further - only feeling what needed to be done - Inner listening and the allowing to be guided. The next day, I noticed that my hips and lower body were aching....feeling as if I had been out for a run (if you know me - you Know - I don’t do Running) and then I remembered the Session from the night before. When Energetic Healing takes place, or becomes activated, we can often feel: tired, thirsty, achey, or emotional, as we try to find something closer to our Natural Energetic Balance. Imagine years of rigidness and stagnancy, suddenly getting freed up - it might take a time of readjustment to get accustomed to a way that you haven’t known/seen in a Long time. So, yeah, one might be walking a bit wobbly for a few days! Just saying...as an example. Luckily, during this time, I had support that reminded me to - no matter what - stay in the Heart. I know a lot of us have been wounded, but we can’t let that Make who We Are. If something comes up within you, let it move Through you. Don’t let it stay stuck inside. Don’t block tears or emotions. It’s alright to let it come up to the surface. It’s an attempt to find release. This is where You Need to Get Creative with Your Own Healing. Do you need to Hold that little girl, or younger version of yourself, or Now version of yourself - in your minds eye - and tell her she is now safe? Can you wrap your own arms around yourself and let yourself Know - that You are now her Protectress. Draw upon any and every picture, or memory you have of what you envision as a loving, caring, and nourishing environment. Any and every picture, or memory you have of Men who are emotionally caring, nourishing, protecting, and totally loving - they Do Exist. This is what I had to do. I decided I will now focus on all of the Men I know, who are full of love. Letting my heart feel that warmth and safety. Let it rise up, even if it hurts. Rest your hands on your heart. Maybe it’ll take a few days. If it does, it does - just go for it. Put your hands on your heart, over and over again - and ask for Love to wash over you - imagine handing the situation, as a glass ball, to Love. And Allow Love to take Care of it. Love will handle it now.